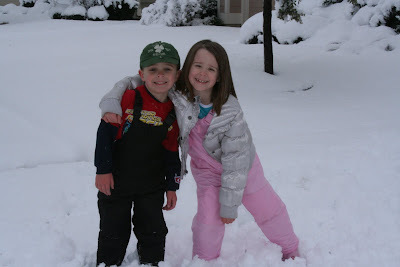 A Day With the Campbells...: Happy Valentine's Day! I hope you all have a very Happy Valentine's Day!! We have had a lovely couple of days with the beautiful snow. North Texas received about 11inches of snow on Thursday night and we are just now seeing it fade away. 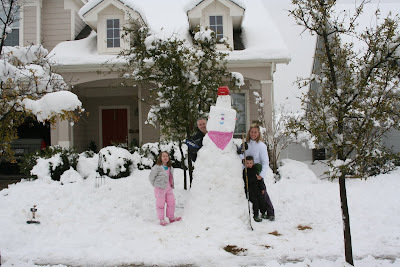 Our family built the tallest snowman that any of us have ever seen, in real life;) We also had great fun with our sweet neighbors! The Lord has blessed us with our home and this neighborhood. We are so very thankful for the friends that we have in our neighbors! Enjoy tomorrow, or today if you are reading this on the 14th. It is a day set aside to recognize love. But, remember that we love because Jesus first loved us. I am so thankful for His love and for His life, death and resurrection that covers all my sin!